One of the minds behind the leading digital advertising platform instructing local business owners to stay away from advertising because it’s easy to overspend and see little return? The sentiment has me left wondering whether the ex-Facebooker was unhappy with his day job, or paid ads are really not all they’re chalked up to be. In an industry in which Pay-Per-Click advertising promises a world where businesses “pay only for results”, one has to wonder whether digital ads are, in reality, the equivalent of choosing Tinder dates over marriage and McDonalds over a nice piece of steak – choosing instant gratification at the expense of long-term satisfaction and sustainability. Nonetheless, local businesses continue to increase investment in digital advertising. 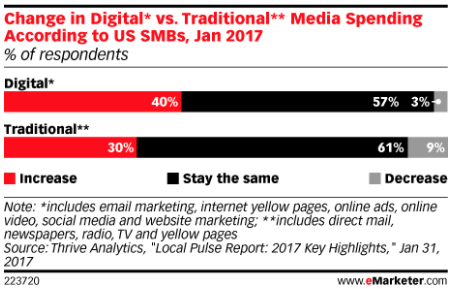 According to an eMarketer report from January 2017, 40% of local businesses planned to increase digital marketing budgets last year.² Safe to say, those businesses followed through on their planning and by June 2017, digital ad spend outpaced television ad spend for the first time in history, ringing in a new era in advertising – one that is primarily Facebook and Google-centric. This rapid shift in marketing activity poses an urgent question for local business owners and marketers alike: how does a local business grow in a sustainable way using the limited time, resources, and budget available? I. Why Do We Search? For decades, families gathered around the television night after night to watch their favorite shows. During the commercials breaks, individuals were strategically introduced to local and national businesses that spoke to the needs and desires of the family, and thus, TV provided a channel for local businesses to get their products and services directly into our living rooms, creating a huge opportunity for ROI and local expansion. In 2018, families gather around the smartphone, meaning that attention has shifted from cable to the digital channels accessible via smartphones – specifically search engines, social media apps, video streaming services, and blogs. These mediums have largely taken TV’s place, boasting unprecedented business-to-consumer and business-to-business for local businesses. To combat this change in consumption, national businesses with spending power have largely chosen to focus marketing endeavors on building and promoting a brand via social media. However, recent data trends emphasize that in order to be successful, local businesses must rely much more heavily on search engines to expand their reach. This data supports a widely accepted conclusion that thousands of local businesses have already begun to adopt – namely, that anytime a person is on the hunt for a solution to a need within their specific locale, there is a very high likelihood that they use Google to do so. Long story short: if your business serves a specific geographic region, yet you’re not visible on Google, you’re missing out on daily opportunities to attract, convert, close, and delight new customers. Let’s take a closer look at a classic local business – a legal practice – as an example of how search can improve marketing efforts and impact the bottom line. In Q1 2017, ILawyerMarketing published a study surveying 400 participants who hired a lawyer in the recent past. To no one’s surprise, it was a law firm’s presence on Google – specifically it’s Google reviews – that were chosen as the single most sought-after piece on information before choosing to move forward with a firm. 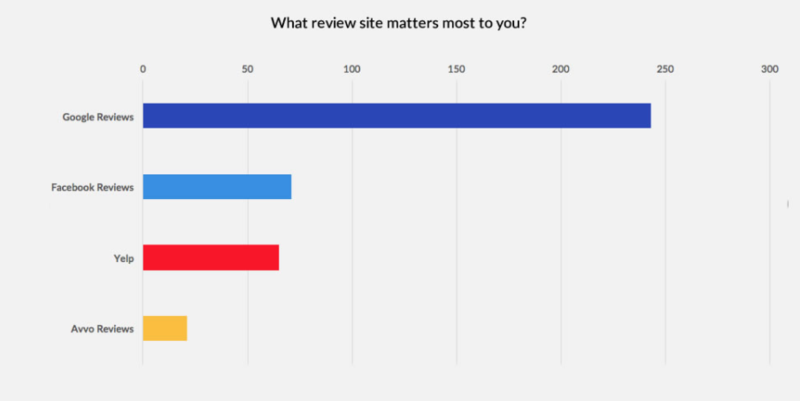 In fact, in 60% of cases, Google reviews on a Google My Business page (which we’ll get to later) mattered most. In addition, nearly 75% of participants indicated that their searches for a law firm were hyper-localized, stating they were willing to travel up to 30 miles from their home to law firm, but no farther. Local businesses now have the ability to determine whether or not they will be visible by their target audience, with an unrivaled level of geo-specificity. Follow along to part 3 of this post to learn more about the tactics required to get there. But first, let’s talk about why SEO versus paid advertisements on a more granular level. The perceived value of advertising on Facebook and Google is simple: the opportunity to drive quick, tangible dollars and cents by tailoring ads to target specific audiences. But there is more to paid acquisition than meets the eye. Visibility. Paid search takes up lots of real estate at the top of Google results pages. With somewhere between two to four ads on desktop and one to three ads on mobile, a user will almost always see Google ads, even if they scroll past them. Targeting. PPC provides a laser-targeted way to get in front of potential customers. Ads can be optimized based on target keywords, time, date, geography, language, device and demographics of past visitors. Speed. It’s self-explanatory – Google Ads can be created in minutes and adjusted on a daily basis. There is no faster way to make your business visible on search than to pay-per-click for advertisements. Marketing intelligence. Since the most recent Safesearch update, Google has hidden vast amounts of keyword data from organic search traffic. One of the benefits of PPC is that no such restriction exists. A/B testing. Using Google AdWords, small businesses can easily test ads, landing pages, and call-to-action buttons to determine which strategies perform the best and drive the highest ROI. Meanwhile, just below those ads lies Google’s natural, organic search results, derived via an ever-changing algorithm that aims to provide searchers with the best possible result for his/her query. Organic search first came into view as a marketing channel nearly 20 years ago when marketers first identified that Google’s algorithm and the sheer reach of it’s search engine proved to offer a viable opportunity for businesses to drive quality traffic to their site. Credibility. Ranking well in organic search drives a perceived credibility with the audience looking for your services. In fact, a recent study showed that 85% of all clicks on Google occur not on paid ads, but their organic non-paid counterparts below. Why? Because organic results convey credibility and ads are ads. Cost Effective. On average, cost per click (CPC) for organic traffic is significantly lower than paid traffic because while instead of paying for each and every visitor to your site (as is the case with ads), organic visits are free once the site has been optimized. Better ROI. Organic traffic offers significantly higher ROI than PPC, and any other form of paid media. For local businesses that utilize a sales process, tools like Call Rail’s call tracking and Google Analytics goal tracking can help to effectively track ROI. Sustainability. Unlike paid traffic, organic traffic isn’t lost the moment you stop paying. As such, investing in SEO is a long-term play that can help sustain a business during times of feast or famine. Competitive advantage. How long does SEO take? Somewhere between 4-6 months for a local business looking to get on the map. 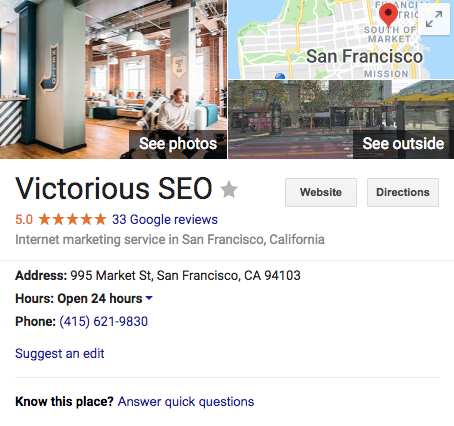 But once a site has established itself firmly within organic results, competitors will have a hard time overcoming, which means a strategic advantage for businesses that prioritize SEO now. Does the quote above describe you? If so, keep reading for a list of how to get started on DIY SEO today. The first step to building a presence in local search is setting up and optimizing a Google My Business account. If you haven’t already, log onto Google’s Business Portal using the same email address you use for your Google+ account (you’ll see why in a moment), add a location using the blue arrow in the bottom right hand corner of your screen, and follow the directions provided. If you’ve requested to claim a business, Google will alert you that a verification code is being sent to the physical address you claimed in the mail. Check your mail over the next 7-14 business days for (your first?) letter from Google; enter the code provided inside to verify the location. Congratulations! You’re now the proud owner of a GMB page! Now, onto the challenging part… optimizing the page to ensure that local searches can actually find you. The process of optimizing your GMB account essentially involves maximizing every field of your GMB and Google+ page in order to effectively communicate to Google that you’re a local business that cares enough to take full advantage of the opportunities they provide you to get the word out about your business online. As a result, you’re rewarded with better rankings in both maps and organic results. This tactic is intuitive. Paper phone books (remember those?!) used to provide households with a directory names, address, and phone numbers (NAPs) for local businesses. If your business was in the phone book, you had a much better chance of being found by folks searching for the product or service you offer. The same goes for Google’s determination of which local businesses should appear in local search results. If one, consistent NAP is present throughout online directories and citation data aggregators, it’s going to send a clear signal to Google that you’re going above and beyond to ensure searchers aren’t left wondering where you’re actually located or how to reach you. First, head to a site like Express Update to get a picture of where your business NAP is currently being listed, and then manually reach out to each directory showing an incorrect NAP. Once those are cleaned up, look for new online directories where you can build healthy citations that strengthen your geolocal search presence. Is your website set up in Google Search Console? If so, you’re in luck. Schema.org has partnered with Google to offer sites the opportunity to markup their site with something called structured data (think: data that gives search engines more information about your business, products/services, reviews, etc). This is one of the tactics least embraced by businesses small or large because it can be intimidating. But the good news is that you don’t have to be a software engineer or webmaster to set structured data for your local business. By using a tool like this one, all you have to do is input your business information and voilà, you’ve got the code needed to markup your site. Now, just add the code to your site’s footer and you’re all set. 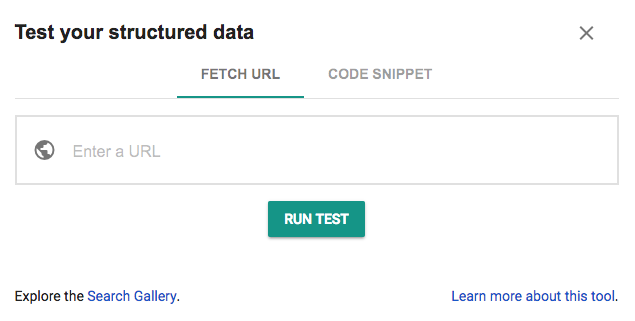 If you’re still not sure whether or not the structured data is in place, Google’s nice enough to have provided a Structured Data Testing Tool so you can double check whether or not the code has been implemented correctly. Does your business service multiple cities or regions? If so, don’t waste your time building out separate subdomains or sites for each. Instead, add a “Location” links in your Navigation Bar, with a drop down menu that showcases each location. Then, link from each location name in the dropdown menu to a unique location-specific page. On the page, write 800-1,500 words of unique content that speaks to the specific ways your business meets the needs of individuals from the region. Consider sharing a success story or two from the location, and include as many geo-identifying references as possible to show Google (and people) you really know what you’re talking about. Lastly, write a unique page title and meta description that align with the target keywords you care about, including the specific location associated with the page in each. Don’t forget to check the length of your page title and meta description to ensure neither are at risk of being truncated by Google! Once your location pages are packed full of unique, optimized content and meta data that follows SEO best practices, the final ingredient to a successful local SEO initiative is link building – the process of acquiring links from other domains to yours. Think of each link as a vote of popularity to the page it points at – a reference telling Google that the page is indeed authoritative, chalked full of valuable information, and satisfying to searchers. Ready to get started on link building yourself? Compile a list of niche websites that interest you, draft up an email template that details why you would make a good guest contributor on their site, and start firing off messages. Don’t have the time to build links manually? Don’t fret. It’s our specialty.